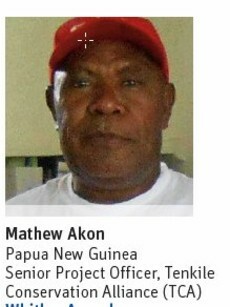 Mathew Akon, Papua New Guinea, is Senior Project Officer of the Tenkile Conservation Alliance (TCA), a NGO established in 2001 dedicated to the conservation of the remote Torricelli Mountain Range, a 250,000 ha area rich in wildlife. The Tenkile is one of several endangered species in the remote Torricelli Mountain range in Papua New Guinea. Mathew Akon – who was born in the area and became aware of the decline in its wildlife – works as senior project officer at the Tenkile Conservation Alliance. For his commitment he was awarded with the Whitley Awards in 2010.